Castel Sant'Angelo: book your tickets now! Castel Sant'Angelo: enjoy your tour with a private guide! WHY VISIT THE CASTEL SANT'ANGELO? 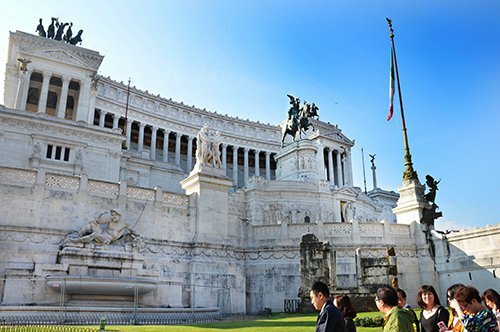 To get to Castel Sant'Angelo it is necessary to cross the Sant'Angelo Bridge, decorated with the statues of Bernini's angels, until reaching this fascinating museum. The rooms of the central body were destined to the popes and inside they contain the room of the chimney, the room of the justice, the room of Apollo, the rooms of Clement VII and the chapel of Leon X. Visiting its seven levels will allow you descend in the various historical periods that characterized the Castel Sant'Angelo, as well as its different uses until you reach one of the most beautiful views of the city of Rome, the Terrace of the Angel, from where you can admire the statue of the Archangel Michael that gave the name to the castle. In 125, the emperor Hadrian was inspired by the Augustus' mausoleum to build his own. Castel Sant'Angelo was built by Hadrian right in front of Campo Marzio to which it was connected through Ponte Elio (Elio Bridge). The emperor Hadrian and the emperor Antoninus Pius were buried inside the mausoleum of Castel Sant'Angelo with their respective wives Vibia Sabina and Faustina Maggiore and their children. In 403 the building was enclosed within the Aurelian Walls and it changed its use of mausoleum being destined to the defense of Rome. In the 6th century, its function changed again and became the state prison under Theodoric. Throughout the centuries, this imposing building was used by influential Roman families and members of the Church until 1367, when the keys of Castel Sant'Angelo were given to Pope Urban V. From this moment, the building was linked to the pontiffs who used it as a refuge, as court and prison. After the unification of Italy, the Castel Sant'Angelo, which had been used as a barracks, was transformed into a museum. WHAT IS CASTEL SANT’ANGELO NOWADAYS? Today, visiting Castel Sant'Angelo means seeing the different parts in which it is subdivided and the three architectural typologies that make it up. In the first levels, Castel Sant'Angelo is a mausoleum restored to the extent possible, as it should have been centuries ago. The fortification of the second level consists of the modifications made in 1900 and previously between the 4th and 15th centuries, in order to use the castle as a fort. Currently it is possible to follow the walkway along the walls that bear the name of the four evangelists. 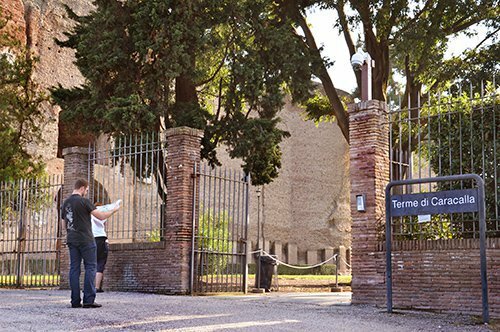 Going up to the fourth level, it is possible to visit the courtyard and the chapel of Leo X, the rooms of Alexander VI and the Clemente VII stove. 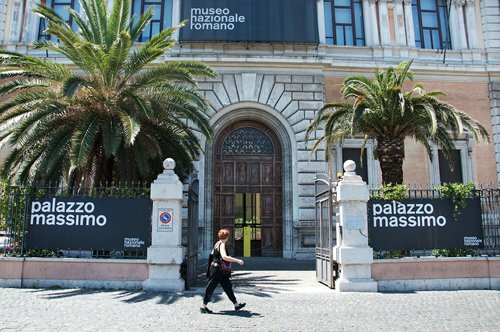 On the fifth level, however, it is possible to see the beautiful Renaissance apartments and in the sixth the library, the treasure room, the "Sala dei festoni", the "Adrianeo" room and the "Cagliostra". 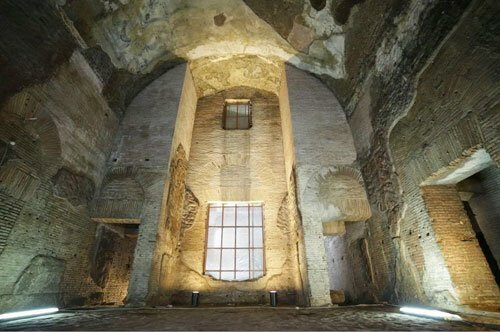 The seventh level has been used as an archive and from here it is possible to access the Terrace of the Angel, which offers a magnificent view of the city of Rome. Did you know that the name Castel Sant'Angelo was given to this mausoleum only in 590? This name is due to the fact that, during a terrible plague, a procession was organized in which Pope Gregory I participated, who had a vision of the archangel Michael just when the procession passed near the Mole Adriana. Shortly after the epidemic ceased and the vision was considered a divine sign. From that moment the Romans called the Mole Adriana Castel Sant'Angelo. 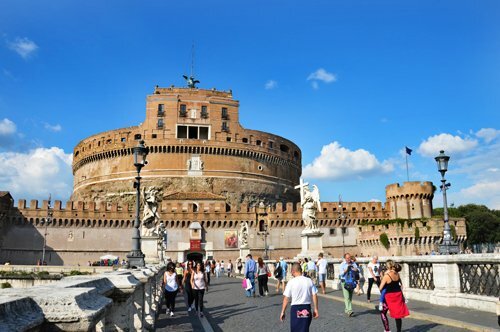 HOW TO VISIT CASTEL SANT'ANGELO? 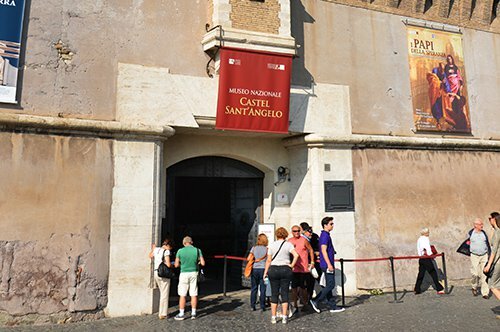 For those who wish to visit Castel Sant'Angelo with total freedom, avoiding waiting at the tickets office, it is possible to book the entry to the museum in advance by buying it online. An interesting alternative to the simple entry is the guided group tour dedicated to the discovery of the most secret aspects and places of the museum.  With this tour, you can visit places generally closed to visitors and go across the very special "Passetto di Borgo" (the secret passage that connects the museum to the Vatican Palaces). 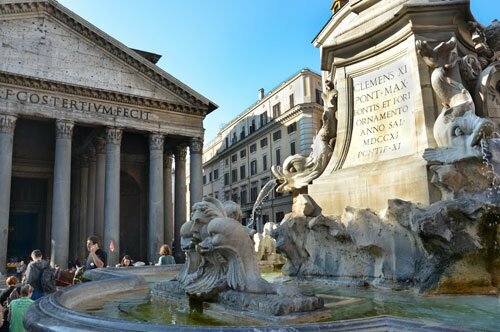 If you prefer to have an exclusive guide for you, you can book a private tour and perhaps combine it with other important places in Rome, such as the Pantheon or Piazza San Pietro (St. Peter’s Square). Crossing the Sant'Angelo Bridge in the opposite direction of the castle, you will find yourself very close to the center of Rome. Following the Map of Rome you can visit the monuments of the eternal city. 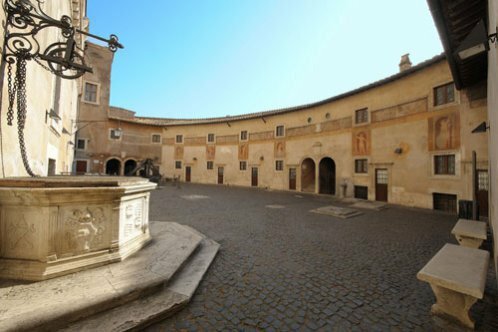 Passing through Navona Square, you will reach the Pantheon and, continuing towards the Colosseum, you will be able to admire the majestic Altar of the Fatherland and not far the Capitoline Museums and the Roman Forum. 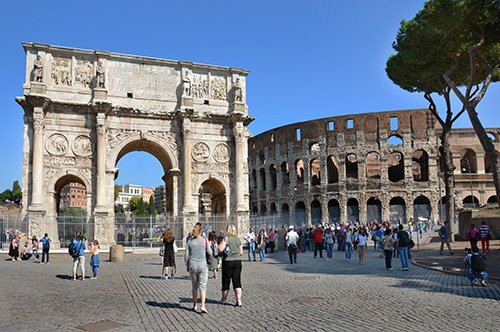 Once you get to the most famous Roman monument, the Colosseum, you can also visit the nearby Palatine Hill. Another destination to visit during your stay in Rome is definitely the Vatican City. Inside you can admire the St. Peter's Basilica and the famous frescoes of the Sistine Chapel. 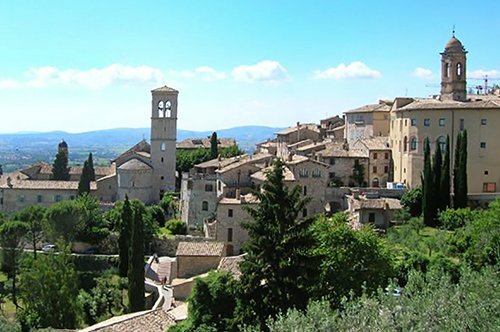 You can also admire the works found in the Vatican Museums or visit the Vatican Gardens. 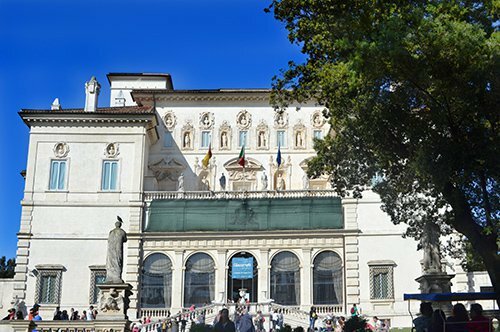 In the Villa Borghese Park is possible to visit the Borghese Gallery and if you prefer to admire the archaeological finds of ancient Rome, you can not miss the Thermae of Caracalla, the Tomb of Cecilia Metella and the Catacombs. If you prefer to stay with the atmosphere of the Imperial Rome, visit the Domus Aurea, the Ara Pacis or the circuit included in the Roman National Museum which is formed by four different venues, the Massimo Palace, the Baths of Diocletian, the Crypta Balbi and the Altemps Palace. All this and much more always following your map of Rome!